With the weekends weather forecast predicted to be gale force winds and raining, i visited the boat on Friday afternoon to gather a few livebaits which i then stored in keep net at the mooring. By Saturday afternoon i fully expected to be going to the boat to release the baits and come home but i held off hoping for a change in the weather next day. On Sunday the wind was still blowing a gale and i seriously considered calling it off.Neil had woke up to no electric and things blowing all over his garden, so decided to give it a miss. My son Dean however, coming on his first trip of 2012 agreed to give it a try,i told him we would probably be fishing from the mooring rather than going out afloat. When we turned up at the boat, it was clear we were going nowhere. It was bobbing about like a cork and the trees nearby were bent over at Forty Five degrees. We decided to tie the boat to the staging to stop it banging about and fish one rod each out of the back. It always sounds worse when your outside on mornings like this, but this was as bad as ive fished in for quite a while. 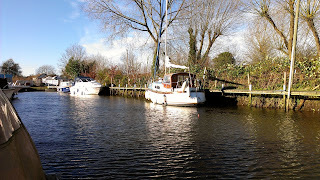 Once we had the boat secured and the back cover opened, it all seemed much cosier, like fishing out of a floating bivi. We both started on float ledgered dead baits and then got comfortable, out of the rain and wind with the kettle on straight away. By now it was about 7am but still very dull and miserable. We fished on like this until 9am then Dean switched over to a paternostered Live Perch. We are on our second coffee of the day when Deans float moves around a meter against the tow. 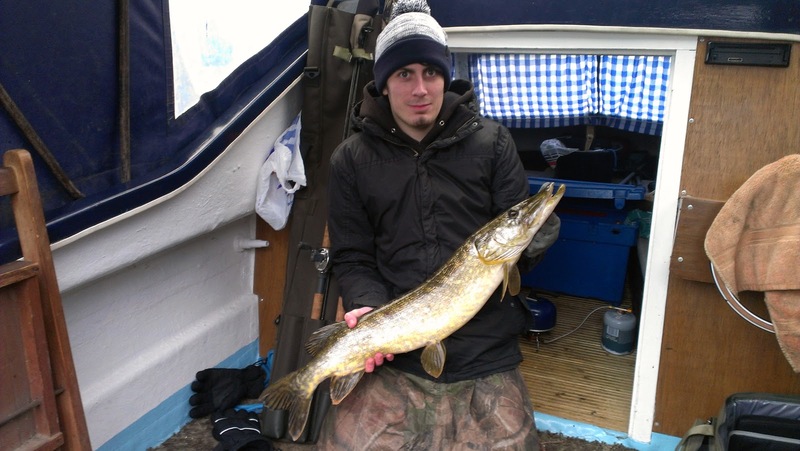 It then buries and he is into his first Pike of the season. 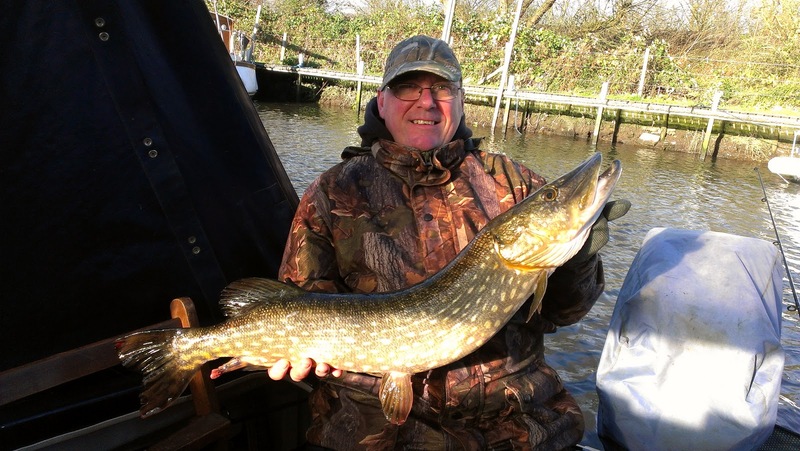 A bit rusty from several months of not fishing, the Pike which he eventually boats goes 8lb 4oz. Not bad way to get off the mark. I resist the temptation to change my rig over to a livebait, but at half Ten im flicking out a small live Roach into my side of the Dyke. Its a full Thirty seconds before my float shoots off, im thinking ive got the depth wrong until the rod hoops over. I'm soon un hooking a 5lb Jack. The interesting thing about this fish, its one im sure ive had before while fishing in this dyke. It has a distinctive "Glass" eye (looks like cataract trouble) and battle scars on its side. Looking back through my diary, im sure i caught it last year. Its nickname will now be "Glass eye" and its soon back into the dyke and away. In the picture you can clearly see, unlike this Pike, its Frosted eye and scars. I re bait with a similar sized Roach and re position back up the dyke. 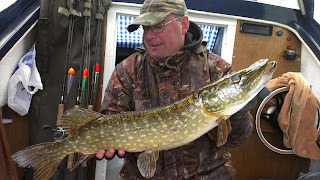 Almost Two hours passes without anything when suddenly my float "Jumps" up out of the water followed by a striking Pike. No need to strike or anything here, i just pick up the rod and its game on. This fish instantly feels better and even manages a couple of decent runs against the clutch of my 6500 reel. Dean does the business with the net and it goes 8lb 5oz. I'm straight back into the same area within Five minutes and am surprised to see my float sliding off again straight away. Again the fish powers off and gives a lovely account of itself. This one looks a double and after quickly un hooking, indeed it goes 11lb 6oz. "you wont catch Pike staying at home". Looks a very nice spot, ideal pike home.